Sometimes it appears that I don't know what I'm talking about. In my "Five Modules That Didn't Work For Me" posting, I pointed to the Tiptop Z4000 as a module that was tough: it had weird scaling on the ADSR pots, some hard-to-get controls for scaling and offset, and a lack of CV attenuators. So I dropped it. And started looking for an alternative. The fact is, there is no decent VC-ADSR that will fit in a skiff format, is easy to find/attain, and works consistently (and the way I want it to work). So, as a result, I come hat in hand back to the Z4000. And it is fine, especially combined with a CV Tools (for attenuation) and an O'Tool (to make sure my deviator setting is kosher). I sometimes wish that I was one of those bloggers that was never wrong, had a rock-solid opinion that never wavered, and could carry the day against the hoards of nay-sayers. 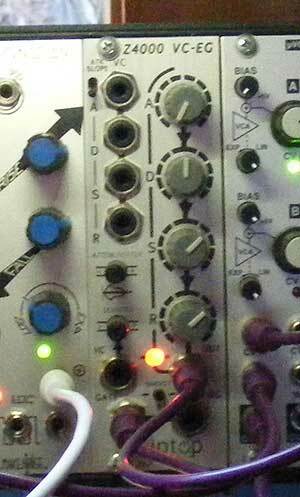 But, alas, I'm probably a more typical modular guy; never satisfied, always searching, often misguided. The hard part is having the patience to wait for that right combination to bring a particular module to life. I have a Dave Smith DSM01 that I was ready to part with until one lucky day I hit it with the right LFO from a 4ms PEG and magic was in the air! Good point, there. My experience with the DSM clearly didn't catch the PEG wave - but I really experienced this with the Nebulae - the right modulators turned it from a sad RPi to a very happy Chatty Cathy!